Which holidays do Amish celebrate? Do Amish children go trick-or-treating? Do Amish people go on vacation? Amish observe numerous religious holidays that other Christian groups do, including Christmas and Easter. In some communities they also commemorate days such as Ascension Day, Easter Monday, Pentecost, and Second Christmas. Depending on the employer, Amish workers may receive time off for secular holidays including Labor Day and the Fourth of July. Read more. Amish do observe Christmas, though since they hold church services every two weeks, it’s unlikely church will be held on December 25th, but with the day being commemorated on the day of the closest Sunday service. Amish people eat Christmas dinner, exchange simple gifts, and may observe the day by discussing the birth of Jesus with children. Amish schools often have a holiday program which is put on by the schoolchildren and attended by parents, and which can include poems, songs and plays. Some Amish also celebrate Old Christmas. Do Amish children trick-or-treat on Halloween? Amish do not celebrate Halloween. Though some have reported seeing Amish children trick-or-treat in one Ohio settlement, this is not a holiday Amish people observe. Some Amish may display decorative pumpkins and gourds though do not have a custom of carving jack-o-lanterns. Many Amish take trips, often to visit family in other communities. Amish men may go on hunting excursions in other areas of the country. Amish people living near the East Coast or large cities may visit the ocean, museums, and zoos. Quite a few Amish visit the southern settlement of Pinecraft in Florida. Taking a trip can be expensive since it may involve hiring an “Amish taxi” for a large family to travel. Coach services catering to the Amish are a popular option for long-distance travel to select destinations. To Cite this Page: Wesner, Erik J. “Holidays.” Amish America. Erik Wesner, 16 Feb. 2015. Web. [Date Accessed]. 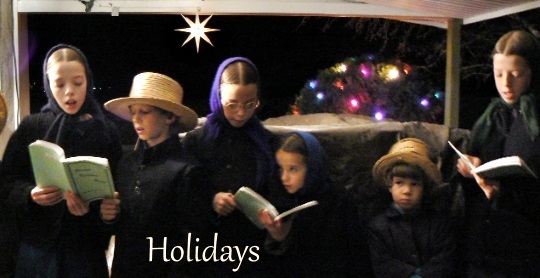 <http://amishamerica.com/holidays/>.